This insideBIGDATA special report series explores the intersection of AI and healthcare. In this entry, we cover some of the latest research and healthcare AI results for both vision research and cancer treatment. Discover how AI is impacting these areas of medicine. Powered by the Dell EMC PowerEdge servers, CSIRO’s large-scale scientific computing system provides capability for research in areas as diverse as virtual screening for therapeutic treatments, traffic and logistics optimization, modeling of new material structures and compositions, machine learning for image recognition, and pattern analysis. Dubbed “Bracewell,” it is a turnkey system built on Dell EMC PowerEdge platform, with partner technology including NVIDIA GPUs for accelerated computation and Mellanox InfiniBand networking, which pieces all the compute nodes together in a low latency and high bandwidth solution faster than traditional Ethernet networking. One of the first research teams benefiting from the new processing power was Data61’s Computer Vision group, led by Associate Professor Nick Barnes. His team developed the software for a bionic vision solution that aims to restore sight for those with profound vision loss, through new computer vision processing that uses large scale image datasets to optimize and learn more effective processing. A trial, held at the GP Superclinic at Midland Railway Workshops in Perth, was funded through an NHMRC grant and base funding from WA Health and CSIRO through the Australian Tele-health Research and Development Group. During the trial, general practitioners successfully screened 187 diabetic patients, taking high resolution images of their eyes, which were then analyzed by the technology for signs of diabetic retinopathy. The AI-enabled grading software, affectionately named Dr. Grader, was developed by researchers at CSIRO. By analyzing ophthalmologists’ grading data, Dr. Grader was able to improve its ability to detect various signs of disease in patients. Importantly, as a basis for comparison, the images were also analyzed by an ophthalmologist, and the technology was found to be as effective as the specialist in detecting signs of diabetic retinopathy and grading its severity. An example of healthcare AI, Gustave Roussy, a leading European center for cancer treatment, sought to increase the processing capabilities of its bioinformatics platform to support more genome analyses per day while enhancing research programs. A pioneer in the development of an innovative treatment for children with cancer, the work of the center is part of a European-wide program for cancer treatment. The process of treating young patients begins with the detailed analysis of tissue samples, and it’s crucial that this analysis takes place as soon as possible—ideally within one month—to maximize the effectiveness of subsequent treatment. However, the existing server environment limited the speed at which the biologists could work to just 12 analyses simultaneously. With each sample generating 23 gigabytes (GB) of data, the 300 GB required storage was also an issue. With 200 children and two analyses necessary for each one, the center’s storage needs continue to rise. Gustave Roussy is one of nine partner organizations within Dell EMC’s Children’s Cancer Care program. This global initiative—part of the Dell EMC Sponsorships and Giving program— involves a multimillion-dollar commitment that covers both technology and volunteering by Dell EMC employees. 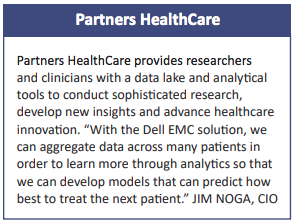 The Genomic Data Analysis platform—the Dell EMC Ready Solution for HPC Life Sciences—was chosen as the solution best suited to the center’s high compute needs. Comprised of Dell EMC PowerEdge R820 and R630 servers, the solution is 11 times more powerful than the previous server infrastructure. It can run 12 billion processing tasks per second, meaning that genome analysis results are available in 25 hours rather than 30 hours. Moreover, the platform enables the center to run 96 synchronous genome analyses per day—an increase by a factor of eight. Two Dell EMC storage solutions can contribute to the performance and sustainability of the Dell EMC Ready Solution for HPC Life Sciences solution: Dell EMC PowerVault storage arrays for fast storage and a Dell EMC Isilon scaleout NAS for the most critical data, providing total storage capacity of 1 petabyte.